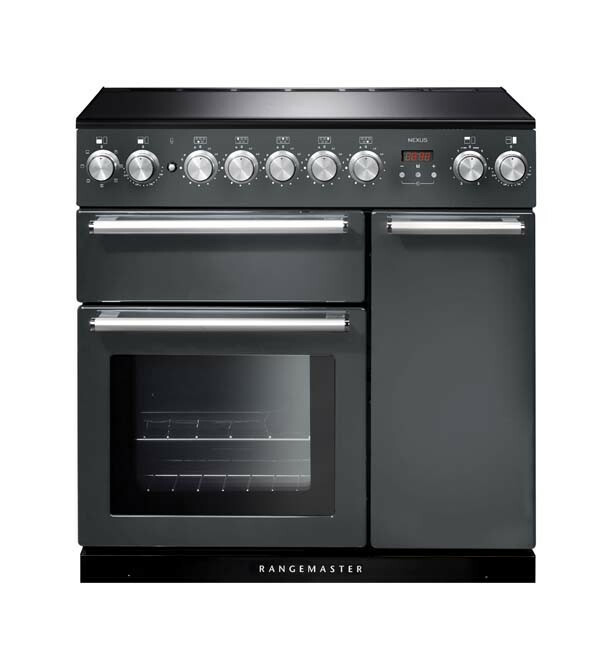 The Rangemaster Nexus 90 Induction offers a contemporary style range cooker that also delivers on performance boasting two large capacity ovens, a separate grill and a dedicated slow cooker. With its sleek design, ultra modern rotary controls and chrome tubular handles it will blend seamlessly in to the most modern of kitchen designs. The 5 zone Induction hob is fast, responsive and incredibly controllable, offering the ultimate in speed and energy efficiency, heating just the pan not the hob itself. Spillages won’t burn to the surface making cleaning exceptionally easy. The added safety measure of residual "hot hob" indicators makes induction a great choice for families. Rangemaster’s unique Preparation and Simmer settings for melting butter and chocolate, simmering vegetables or cooking pasta help to create perfect results every time. The Nexus 90’s left-hand oven is a Multi-Function oven which offers eight functions and totally flexible cooking options. The Multi-Function oven has both fan and conventional functions combined with grilling, base heat and browning elements all of which can be used individually. Other useful features are the defrost setting where the fan draws cold air from frozen food without using heat thus speeding up the defrosting process along with the Rapid Response setting which utilises the top element to heat the oven to temperature 30% faster than using just the standard fan setting. Available in a selection of colours there is a Rangemaster Nexus 90cm Induction Range Cooker which will look perfectly at home in any kitchen. Choose from black, slate, white or stainless steel all combined with a stylish chrome trim.